Insurance Visions, Inc. creator of ecertsonline is a team of innovative developers and solution service specialists. The best companies don’t just make money; they contribute ideas that can transform entire industries, even entire economies. What sets us apart from the rest is a relentless approach to innovation, stellar service, and a team that understands and values — a “can-do” attitude. The best brands are known for one thing and doing that one thing really well. The challenge for most organizations is being willing to commit to that one thing. When an organization has a clear focus, the objectives are clear and the team can get aligned around this one core direction to become the best at what they do. Our objective is to be the best at what we do. To design, create, and deliver the most innovative web-based software for managing certificates of insurance. Insurance Visions, Inc. is an industry trusted technology company specializing in on demand Software as a Service (SaaS). Our service offerings include industry specific web-based business processing solutions to address the needs of the insurance agent, general agency, carrier, broker, policyholder, and the self-insured. Our focus is simple. In our world you decide what we build. Client collaboration devoted to streamlining the document process for certificates of insurance. Agency users demand services, control, and customization that are relevant to their growth strategies and client service needs. They want this at any time, any place and on any device. As the innovation engine behind ecertsonline Insurance Visions, Inc. is delivering solutions that help you drive more value out of your bottom-line. Today, hundreds of leading agencies and tens of thousands of users are experiencing more–streamlining business processes and improving customer care. A dedicated management team along with a highly knowledgeable customer centric service and support staff Insurance Visions has become a recognized industry leader for insurance certificate management. Insurance professionals and their clients are dramatically improving their productivity while reducing complexity and overall operating costs with the use of ecertsonline. 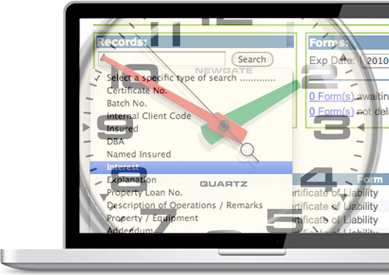 The ecertsonline application is a web-based on demand Software as a Service (SaaS) document management system (no hardware or software needed) that allows the agency/producer to create, issue, deliver, store, and share certificates of insurance. Used internally by agency staff members and/or optionally by the insureds for their on demand certificate needs 24/7. With just a click of the mouse ecertsonline makes it simple to renew one or thousands of certificates at the same time. To date we have made more than 20 million certificates of insurance deliveries and have satisfied the certificate needs of hundreds of clients and tens-of-thousands of users. Certificate of insurance deliveries are made via e-mail, fax, forms on disk (CD), U.S. Mail, Next Day Air and direct online access. Form types include: ACORD 20, 21, 22, 23, 24, 25, 27, 28, 30, 31, 50 Auto ID Cards (all states including NY), 101 (Additional Remarks Schedule), and/or customized forms, along with personalized endorsements, schedules, addendums, attachments, cancellation, reinstatement, compliance notices, and/or literature mailings. Form types include: CSIO (Canadian) C0910ECL, C0911ECP, cancellation, reinstatement National and Alberta. Multiple delivery method options allows the user to send certificate(s) along with attachment(s) to the certificate holder and (Cc) to any number of third-party recipients e.g. Insureds, Carriers, Lienholders, etc., etc. At any time in the future the agency/producer and/or insured may retrieve a copy from the online security protected record-keeping archives. Automated Delivery System. ecertsonline provides an in-house commercial printing and fulfillment center that saves you valuable time and money. No more late nights spent printing, copying, collating, folding stuffing, stamping and mailing. All of these time consuming tasks are handled for you with a simple click of the mouse.